The third of four days of the round of 16 presented two more matches. Both France and Nigeria started the match off with intention, as both squads attacked quickly from the very whistle. In just the first five minutes of the match both teams enjoyed possession in the opposition’s penalty box, and both had corner-kicks in their favor in just the first three minutes. In the 19th minute Emmanuel Emenike seemed to put his side ahead after meeting a low cross with a good touch past Hugo Iloris, but the flag for offside was up. Then Pogba almost put the French at an advantage with a great side-volley, but Nigerian keeper Enyeama was up to the task making a good athletic save. The match seemed quite open, with both sides attacking almost at will. Just before the half-time whistle Nigeria could have had the advantage if it was not for a save by Iloris from a strong Nigerian strike from distance. Attacking football was front and center in this one, but surprisingly the half-time score read 0-0. The second half began just as the first, with both sides leaving defensive priorities aside and "going for it" with a much more attacking minded style of play. Both the Super Eagles and Les Bleus had their chances but the defenders and keepers on both sides of the pitch seemed ready for the action. In the 70th minute France got their biggest chance of the match so far, when Karim Benzema found himself one on one with Nigerian keeper Enyeama after some very impressive passing combinations by the French. Enyeama made himself big and got a touch on the ball taking the speed away from the spinning Brazuca. After the save the slow moving ball was cleared just before the goal-line by the Nigerian defense. France seemed to create more attacking chances as the game went on. Tiredness was taking over the Nigerian squad as the French pressed on. In the 77th minute after a corner kick for the French, Yohan Cabaye's shot from just outside the box left Vincent Enyeama helpless, but was stopped by the crossbar. Just a minute later Benzema had another chance, meeting a perfectly crossed ball into the box with his head. Enyeama (as was the case for most of the match) again made a spectacular save. On the ensuing corner kick however, the French would take advantage. Vincent Enyeama who had saved his side on so many occasions on this day came out to meet the cross, but instead of catching it or punching it out of the box, the Nigerian goalkeeper was only able to put a weak palm on the curling ball, deflecting it directly onto the head of Paul Pogba who's reflexes were sharp, heading the ball into the empty net. With the Nigerians visibly exhausted, France pressed on. And after a couple more good saves from Enyeama, the French would put the goal away after a low cross into the box clipped the leg of Nigerian Joseph Yobo and went past the Nigerian goalkeeper for an own-goal in the 90th (+1) minute. The North African "Desert Foxes" came into this round of 16 match with few expectations of advancing. The Algerians' progress to the round of 16 was historic in its own right, but for the Germans nothing less than a comfortable win would look disappointing. In just the first few minutes it was apparent that the Germans have a football style that is superior to that of the Algerians, as the Europeans attacked from the very start. But in the first 10 minutes it were the Algerians with a great chance on the counter break, but the German keeper Neuer read the situation well and came out to meet the Algerian attacker at the correct time to put the ball out for an Algerian corner-kick. Again it was the Germans on the front-foot, but again Algeria were creating the more dangerous scoring chances when an Algerian shot from inside the German box went just wide of the goal in the 19th minute. The rest of the first half was largely controlled by the Germans, but it seemed that Algeria had a defensive answer to every German attack. At the half, it was already an unlikely 0-0 draw. The Germans started off the second half with intent. Unfortunately for the Germans however, Mustafi's header from a corner-kick landed right at the hands of the Algerian keeper in just the 48th minute. With the second half approaching the mid-way mark, it was the Germans who were pressing at any available opportunity. With every attack looking more and more dangerous, the Algerians were starting to look content to play for the draw and possible penalty shootouts. In the 79th, a huge opportunity for the Germans to take a deserved lead, but the point-blank header was athletically saved by the Algerian keeper, who in fact was having a very solid match. A minute later, another chance for Müller from inside the box, but his shot was just wide of the goal. It was starting to look that a goal was not in the cards for this particular match. Could the Algerians pull off a third win in three meetings with the Germans? With the match in its 90th minute, another flurry of chances for the Germans, but again none are able to put them in the back of the Algerian net. This is the third match of this round of 16 going into the extra frame. The extra-time period started with a bang. Thomas Müller put a ball into the box, and André Schürrle gave the Germans an advantage they should probably have had much earlier. Germany would score once again when Ozil after a solid performance would get his goal at last in the 119th minute, after the Germans "undressed" the Algerian defense with a series of passes. The Algerians had one answer, and would bring the match back to 2-1 about 15 seconds after the German goal. 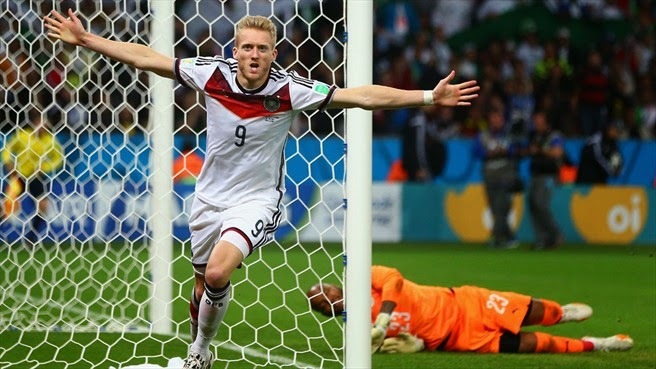 But the goal came a little too late as the Germans advanced to the quarter finals, after a nervy round of 16 match against the Northern Africans from Algeria. So all three of our guys picked both France and Germany to win, but Iain did so with the exact score for both matches on the day. Full points for Iain.